This past weekend, I exhibited at the Warsaw Comic-Con — apparently the first event of its kind in the city. It was a new experience for me, too: the first time I'd tabled outside the UK, and my first broad fan convention. (I've preferred to exhibit at shows centred on comics or publishing back in the old country.) I'd also never exhibited at an event longer than a weekend, so I expected a four-dayer to be rather grueling — but the duration turned out to be perfectly fine. I met some cool folks and sent out a bunch of comics into the hands and homes of a new crowd of readers. Thanks to everyone that dropped by, bought books, and talked with me (despite my lamentable lack of Polish). Being a new show, the organisers wanted to try to be everything to everybody, hosting a wide range of exhibits and events relating to comics, games, manga/anime, cult film & television, spec-fic, general pop culture fandom, &c. My little table was nearby a small group of other (larger) comics-related stands, and areas dedicated to relevant workshops and signings, but some people I spoke to had hoped to find more stuff related to independent comics creators — the fundamental aspect of comics culture that was rather under-represented there. On Sunday evening, one of the organisers told me that they want to make the show more about comics in the future — so we can hope that they will build upon the experience of running a solid fan show and provide more for readers seeking comics next time. Infinite thanks to Iza S. for keeping me company for the whole show, and helping me in countless ways (including sharing the burden of wrapping krówki — see above — which was her idea, as an edible 'business card' and little giveaway for passing guests). I rather forgot how freezing a tent can be in late Autumn - my feet felt near-frostbitten in my boots by the end of each day - but I had another great weekend, as one expects of the UK's best comics convention. I was allocated a table with Michael Lomon, who proved to be a great table-mate; I haven't got round to reading through my Thought Bubble acquisitions yet, but from a purely superficial assessment, his new webcomic The Palace of Tears is looking lovely. My next convention will be Robot Con in Sheffield, at the Millenium Gallery on 25th March 2017. I know a couple of people who exhibited at the 2016 show, and it seems to be an interesting new event. Hopefully I'll be seeing you there - with copies of Killjoy #6, which will contain the second part of 'The Great British Summer Holiday'! I also took part in the academic conference that precedes the convention, Comics Forum. I was there for the Friday, presenting my short talk ('Docu-Comics: An Artist's Perspective') about educational comics & my contribution to Portraits of Violence during the final panel. It was my first ever time at an academic conference, and my first solo presentation since secondary school (I only gave one group presentation during my first year of university - hurrah for arts degrees!). Although I felt very nervous, and fumbled and quavered my way through twenty minutes of blathering, I received some positive feedback & met some swell people. I really enjoyed the other talks - it was an interesting day. I also brought a bunch of copies of Portraits of Violence to the convention, and it caught a lot of people's curiosity. I sold out of my few copies and had to grab a couple more from cool co-contributor Yen Quach, who was also exhibiting in the Marquee (thanks, Yen!). Fun fact: the hand-drawn elements of the logo were daubed with a discarded toothbrush. And, also, a small announcement: from today, I'm embarking on a project called EMOJICA, in which I plan to publish a drawing inspired by an emoji (based upon randomised selections from the Unicode standard) on a daily basis. The idea first came to me shortly after Oxford Dictionaries' announcement that their 'Word of the Year' for 2015 was, for the first time, an emoji - namely 'Crying with Laughter'. A number of months later, I decided to launch the project today, the first anniversary of the aforementioned announcement. I'd be grateful if you'd check out the website, and follow/like the various social media accounts (Instagram, Twitter, Tumblr, Facebook). The first one of my 971 selections that I picked 'out of the hat' (or, more accurately, was provided algorithmically by way of a Google Sheets formula) is only a little premature in its seasonal relevance: emoji number 183 in Unicode 9, 'Santa Claus' (U+1F385). After five weeks of scribbling, from London to Warsaw, I'm now awaiting the delivery of Killjoy #5 from the printers (i.e. the wonderful Comic Printing UK). Hop over to the Shop if you'd like to order a copy. Much of this issue was produced more spontaneously than previous 'medium-length' stories of the Catch a Fairy project - with less pre-planning - and I'm hoping this process results in a pleasing narrative effect. 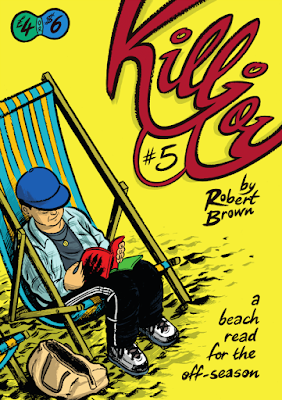 Unfortunately, I broke my rule of keeping every issue of Killjoy self-contained: issue five contains the first instalment of a longer story - which I'm planning to conclude in issue six - 'The Great British Summer Holiday'. In the technical production of this issue (including flatting and general colouring assistance in the making of the above cover), I was patiently and fruitfully assisted by Iza Świderska, without whom I probably wouldn't have met the print deadline for its planned debut. Many thanks to Mecha-Iś! (Left) Makeshift studio in kitchen; (Middle) Work-in-progress pages; (Right) Some cartooning apparel. Speaking of debuts, I'll be sat at table 69 (snigger) in the comiXology Marquee at the convention of the Thought Bubble Festival on 5th-6th November 2016, with the first copies of the new issue to be offered for sale. 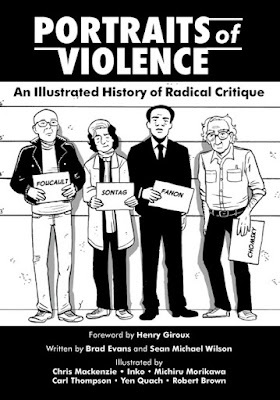 I'll also be bringing along a few copies of Portraits of Violence: An Illustrated History of Radical Thinking, published by the New Internationalist, for which I illustrated the chapter on Foucault (and drew the title-page portrait of Arendt). I hope to see you there. 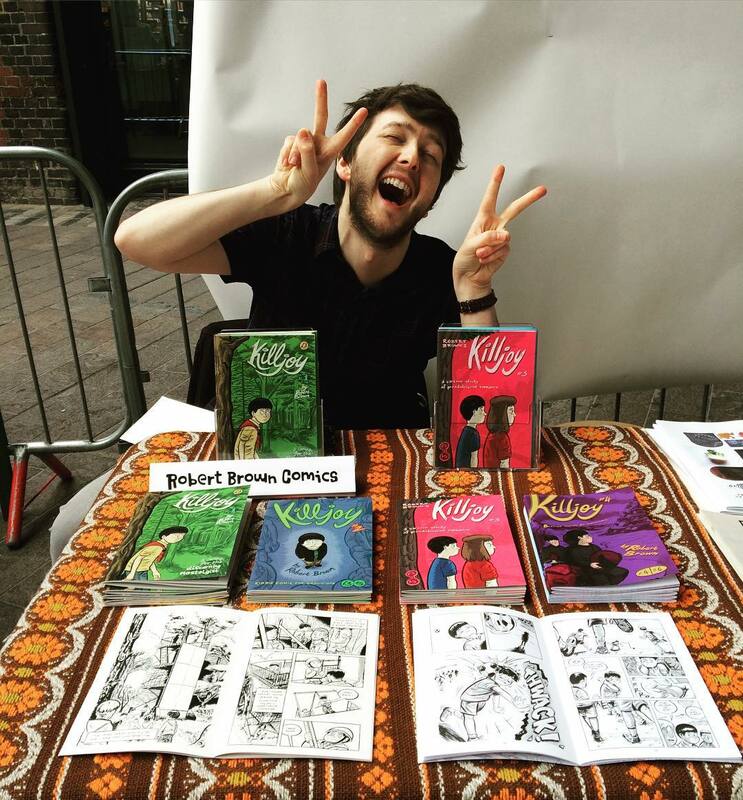 I was happy to hear that the Comica Comiket was returning this Spring (14 May), as I'd really enjoyed my time with them back in 2012 and 2013. Given the (lamentably) stiff competition for table space at London conventions, it was nice to get a spot at my first comics-specific show in the Big Smoke for two-and-a-half years. Thereat, I released the second edition of Killjoy #1, featuring a redux version of the 'Cub Camp' story adding three pages and grey tone, as well as reworked versions of a couple of panels. (Check out some sample pages over at the Shop.) Comiket took place in the sheltered courtyard of the House of Illustration, in King's Cross, on a mild Spring day; probably due to the event's recent resurrection and fairly late announcement, the footfall was lighter than in the previous years I attended, but it was an enjoyable event nevertheless. I look forward to their future shows. 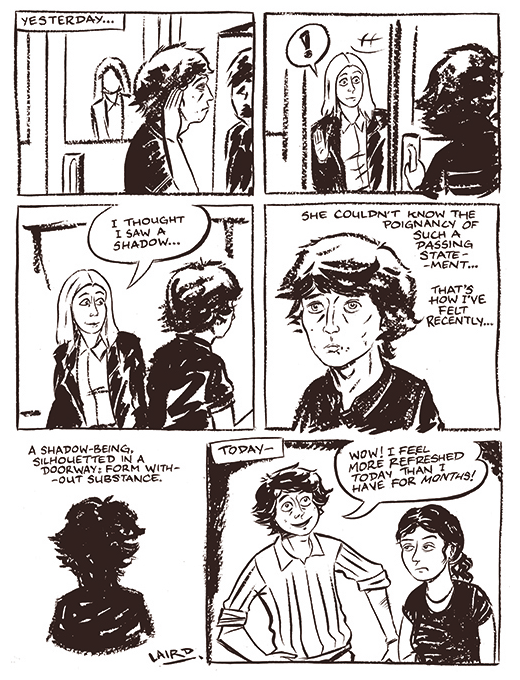 A short autobiographical strip, drawn on 23rd March 2010 - still feeling that obscuration of identity caused by day-jobs, to some degree.